Quilt the rainbow with Tula Pink and Angela Walters! Add color and punch to your next project with Quilt with Tula and Angela. Known for her cool, innovative style, Tula Pink will inspire you to toss your mundane color wheel and commit to her signature approach. Angela Walters creates the complementary finish and surface texture for each design, resulting in the perfect marriage of color and style for each of the featured 17 quilt projects. Pairing one shape with one color family in each chapter, you'll step through quilts of varying sizes, at the same time enjoying a front row seat to the creative collaboration between these mavens of style. In addition to the 17 signature Tula Pink quilt designs and 24 quilt design motifs from Angela Walters, you will also be treated to useful tips on tools, piecing, backing, binding, and even long arm quilting. 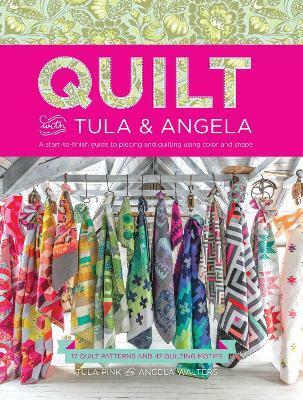 Featuring bold illustrations and gorgeous photographs, Quilt with Tula and Angela is the comprehensive color education you've been waiting for. Tula Pink is an icon of the fabric and quilt work. She has designed over 20 fabric collections for Free Spirit Fabrics, as well as thread collections, ribbon and trim collections, needlepoint kits, her own line of sewing tools, Tula Pink Hardware, and is an International Spokesperson for BERNINA sewing machines. She is the author of Quilts from the House of Tula Pink, Tula Pink's City Sampler, and The Tula Pink Coloring Book. Angela Walters is a longarm quilter, teacher, fabric designer with Robert Kaufman, and the author of several bestselling books, including Free-motion Quilting with Angela Walters and Shape By Shape Quilting. Angela has turned her love of stitches and fabric into a thriving business focused on modern machine quilting.